Hi everyone! I came across this inspirational video and wanted to share it with you. 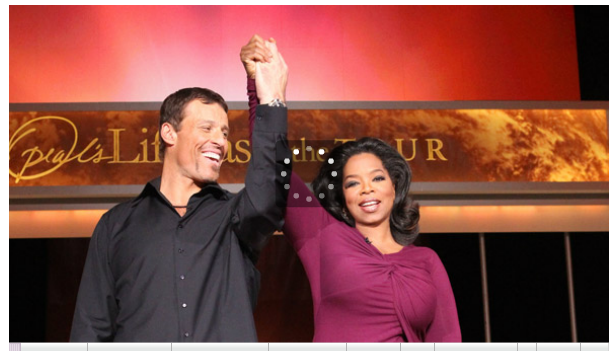 It's from Oprah's Lifeclass series featuring Tony Robbins. It's super motivating and will definitely put a smile on your face. Plus, Tony is a super cutie pie! I also had a look at some of her other Lifeclass videos featuring Deepak Chopra which are also great and worth taking a look at! This one in particular deals with living without any fear - nothing holding you back. Isn't the thought in itself is so relaxing? I think we all have little things holding us back from time to time. One of my biggest fears, believe it or not, was public speaking. I used to be very shy and super awkward whenever I had to give presentations in class. With a little practice, and lots of readjusting my way of thinking, I've thankfully moved passed it! Facing your fears is a great way to conquer them, so putting yourself out there and owning that fear can really have a huge impact in your life. I try applying this to even the smallest things, like for instance if I have a pile of dishes stacking up and I feel like putting it off time after time, I just get up and do it so it's done! Sometime's Nike's tag "Just do it" puts me into "let's-get-this-done" mode real quick. This can also apply to other area's of life, like exercising. The end result is of course the big reward cause you know you'll feel so good when it's accomplished! "You can conquer any fear if you will only make up your mind to do so. For remember, fear doesn't exist anywhere except in the mind." Annie! This video is so inspiring and amazing! I watched this movie 4:00 in the morning instead studying for my boring anatomy finals. lol. Haha same here ^^ I have my final abnormal psychology exam tomorrow and watched this at 3am! It really did uplift me and show that you can do absolutely anything if you have the right mindset :) Thanks for sharing Annie! what an incredible video... thank you for posting it...I usually don't watch Oprah but this is so inspiring!!!! Just to say that you are amazing and that I love your blog! Hi Annie! Love your blog and videos! Your blog is a daily stop on my web browsing routine :D I guess a fear that holds me back is the idea that I wont find someone who loves me. After it didnt work out with my longtime boyfriend, I had a fear that I wouldnt find someone who accepts me for me, and accepts the fact that I'm saving myself for marriage. With the help of you and your inspirational posts I've faced that fear a little bit, and allowed myself to think that there IS someone out there for me. So your ideas of a healthy lifestyle and taking care of yourself have helped me in other areas of my life as well. Thanks so much Annie! My fear is that I will not live up to my own expectations. I'm sometimes very hard on myself, and I hope to accomplish a lot throughout my life like graduate from university, get married to a good man who is good to me, have a family, be a good mother, etc. I've battled through some times of depression when times have gotten hard, and I'm afraid of those moments coming back to haunt me and that I won't be able to accomplish my dreams because of that. But your blog and your videos have truly helped me stay positive, and I believe that I have changed my life a lot from what it used to be. So thank you :) I guess that in a way, you've helped me overcome a little of that fear! This helped me a lot Annie! I love all your videos annie! you so inspirational! everytime im on my macbook,i literally check your blog like 10 times, as im always waiting for you to post a new blog entry! I just wanted to tell you that your VERY inspirational! You make me do so many things that i would never do ever before! Im like your biggest fan, NO JOKE! your so caring, inspirational, fun and down to earth. its a pleasure and joy watching you and all your videos! Its a shame you cant post regulary:( I would be totally addicted to youtube if you did! Keep up the AMAZING job, and the inspirational posts. You make me do so many things like excerciseing, taking proper care of my skin, eating healthily, chucking out negative people in my life. I admire you for that! My biggest fear is also public speaking i avoid it like the plague.. i'm slowly trying to conquer it by being more interactive in my classes and getting that practice in whenever opportunity presents itself. Love your blog, stay beautiful, xoxo. I know you often get a lot of comments from viewers and readers, thanking you for your time and effort, for being inspirational and motivating and in general, just plain darn wonderful. I always get excited when I see new posts (like your new smoothie post as I came to your website to write this!) and videos...but I have never taken the time out of my day to really thank you! You have been an amazing inspiration and the 'friend' (if i can call you that) that I've needed during a period where I have lost a lot of close friends. Watching Lifeclass has been an exceptional eye opener and this combined with my current reading of The Secret is really opening my eyes to how much I have closed the doors to opportunities and experiences based on my current thoughts and attitudes! I just wanted to thank you for your amazingness! You truly are a blessing and its wonderful to see someone with such passion for life, health and wellbeing! Keep up the great work Annie! You have touched a lot of people out there and nothing but good will come your way because of it. Haven't even watched the video, & I already know I'll love it! Once again, you have brightened my day & smacked me into "GET IT DONE!" mode!!! THANK YOU!!! I loooooove your blog! I'm allways talking about it to my friends! Just want to tell you that I saw the "Sucker Punch" movie and loved it, because is about one girl that have so many fears (she was abused) and she needs to get ways to escape from the local taht she was sended to. They said one thing that I didn't forget: "You have all the weapons you need, now fight" - "your mind can set you free".